ASPHALT PAVING AND PAVEMENT MAINTENANCE CONTRACTOR. A full-service, family owned business, operating since 1985. Serving all of Connecticut and western Massachusetts. We specialize in Commercial and Industrial projects. We provide quality products and workmanship for commercial, industrial, and large residential properties. Our products meet all Federal and State specifications. We are a State of Connecticut DAS Certified SBE contractor. An A+ rated business with the Better Business Bureau. We are members of the Connecticut Business & Industry Association and the Motor Transportation Association of Connecticut. We work closely with property owners and managers to assure they receive the highest quality of work using the most cost effective means. We work within budgets and provide long term pavement management solutions. 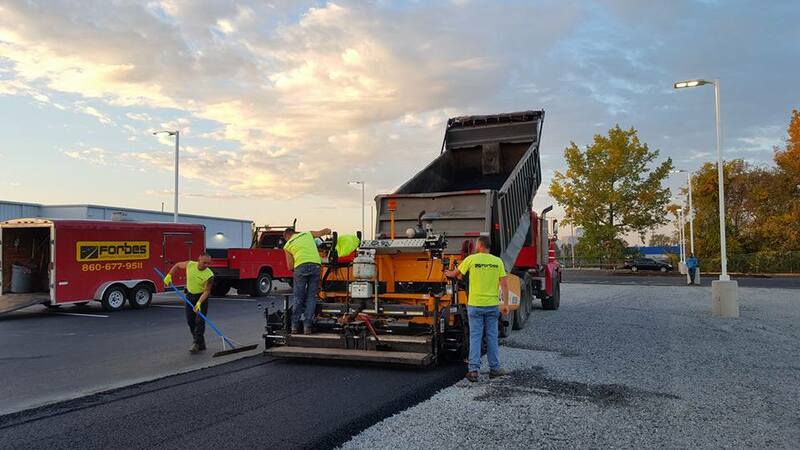 Our staff of highly trained professional installers and applicators are fully licensed and insured, with over 25 years of experience in all phases of bituminous concrete pavements. Forbes Asphalt Maintenance, Inc. is an equal opportunity employer. The employer will not discriminate and will take affirmative action measures to ensure against discrimination in employment, recruitment, and advertising for employment, compensation, termination, upgrading, promotions, and other conditions of employment against any employee or job applicant on the bases of race, religion, creed, color, national origin, or sexual orientation. Please contact us today to see how we can help you with your pavement needs.